David McIntyre has been enjoying the heck out of his current assignment: touring the Hawaiian Islands in search of the ideal shooting location for a series of film-company projects. What’s not to like? Stunning scenery, great food, sunny beaches… and Rick Sutton, the hot, ex-Air Force pilot who is flying him around. Everything changes when a tropical storm and engine failure forces a crash landing on a deserted atoll with a WWII listening post. Rick’s injuries and a lack of food and water mean David has to step up to the plate and play hero. While his days are spent fighting for survival, and his nights are filled with worrying about Rick, the two men grow closer. 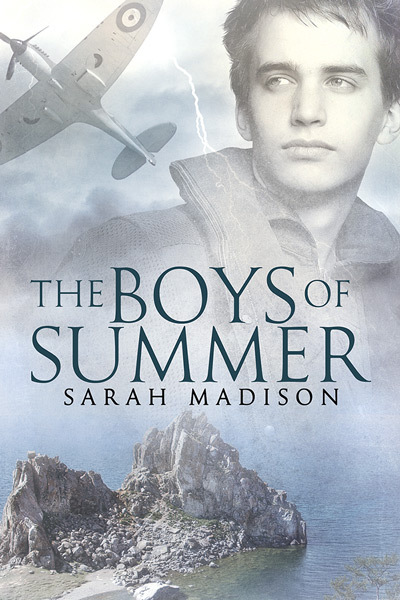 David’s research for his next movie becomes intertwined with his worst fears, and events on the island result in a vivid dream about the Battle of Britain. On waking, David realizes Rick is more than just a pilot to him. The obstacles that prevented a happy ending in 1940 aren’t present today, and David vows that if they survive this stranding, he will tell Rick how he feels. Personal Tags: Action/Adventure; Military; Historical; Older man/Younger man; Really funny; Really sad; High Angst; Hot Angst. The Boys of Summer. This is a second, revised, edition by Dreamspinner Press on December 21st, 2015. It was originally published in 2013 by Createspace. When I saw this come out, again, it called to me like a siren in the night. 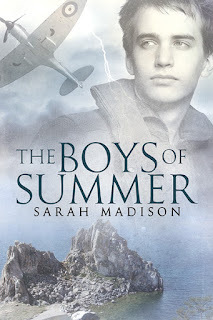 I don’t know why, but the blurb just got to me, as well as Sarah’s description: I was appalled at how little I knew of that time period, or just how great a sacrifice we asked of those young men. It became vitally important to me that I tell their story. Besides: Hawaii! I lived there for a year in my early and madcap youth (I always wanted to use madcap!) and it is truly heaven on Earth. Let’s see if I can convey how much I loved this story without too many spoilers. It’s hard as it is all intertwined and part of the story that makes this such a great read. David McIntyre, ‘Mac’ - David, “Mac”, has a great job as a locations scout— touring exotic locales for a production company that specializes in finding the right scenery for the right price, no matter if you wanted to shoot an old-style Western, a Lord of the Rings clone, or a sci-fi movie set on Mars. His job means lots of travel, which he enjoys. He gets to indulge in his hobby of photography and lots of travel, which he enjoys. He gets to indulge in his hobby of photography, and he has plenty of time to work on his own projects. Not to mention, it gives him an “in” with the movers and shakers of Hollywood, which does more than just get him invited to some of the best parties in LA. It also means that people in the business take a personal interest in his projects. He doesn’t plan to be a location scout his entire career. One day he hopes to have a production company of his own— maybe even direct his own films. Rick Sutton. ‘Sutt’ - Rick Sutton was arguably one of the most photogenic men ever. Sutton was the real deal. Sutton isn’t trying to carefully cultivate a certain look. He just is that look. The first time David had walked into the hangar where Sutton ran his charter service, Sutton had stepped out from behind the plane, wiping his hands on a greasy rag. David could have sworn his jaw hit the floor like that of some cartoon rabbit. It would have been a simple matter to get Sutton half a dozen roles without even trying. David could have cast him as an Indiana Jones type in unlimited adventure films, or as the world-weary private detective in a weekly drama. Sutton would have made the perfect drifter, the down-on-his-luck hero with a heart of gold, the newest video-game character turned into a movie. Here comes the most interesting part, the story. This is a modern M/M romance, with the crusty Alpha type, not too Alpha, just right, and a historical romance thrown in for an amazing, knock me down, effect. The beginning, and the end, of this is straight forward modern M/M, however in the middle of the book there’s this amazingly beautiful historical Easter Egg that is beyond description. The juxtaposition of the modern era story, with its own set of angst filled story lines, with the historical perspective of the WWII era characters is electrifying. Watching the characters in their era brings a feeling that can only best be experienced in the rear view mirror of time and history. Some things really are better in the 21st Century. This book literally had me laughing and enjoying a modern era romance/action story and sobbing at the historical part of it all. Yes, sobbing. Like a little boy. That’s how good this is. The ending of this, back in the modern era, is phenomenal. Brilliant. What a way to drive the whole story home! I’ve read a few of Ms. Madison’s books and this one is, by far, one of her very best. The writing is crisp and descriptive: David looked up to warn Sutton that he was allergic to mold, but his mouth gaped open as he saw him transformed. He looked for all the world like an RAF fighter pilot, and suddenly David could picture him leaning negligently against the side of a Spitfire, flirting outrageously with all the WAAFs. He would have had them eating out of his hand until the very last moment, the very last flight. The pathos in her writing of this is off the scale, it had me weeping and sobbing. Such a beautiful love story: David watched him cross the compound, hoping he would turn, would do anything to acknowledge that this was a substantial parting of ways, but he did not. David was forced to stand at the open car door, gripping the frame tightly as he watched that straight, slim back disappear into the main building. It was the last time he ever saw him. This is one of those rare books that I just can’t get out of my mind. It haunts me and persecutes me and this is such a good thing! The ending, in modern day, doesn’t disappoint and is such darn good reading. Ms. Madison really wraps this up and brings it home in such an excellent manner: Rick crushed him up against the wall. Taking David’s head into his hands, Rick kissed him with the fervor of a man who’d been dying of thirst upon finding water in a desert. David wondered briefly if that was what it had been like for Rick since his discharge— endless sand dunes and miles between each oasis. David wanted to slake Rick’s thirst so thoroughly that he would stop wandering for good. This isn’t the end, though. You’ll have to find that out for yourself. I tend to be very active on the web in my other locations, as these places were developed first. I blog on here on the website, should you wish to read about my adventures as an author, veterinarian, dog lover, competitive horse rider, or just about my random musings. I’m fairly active on Twitter, I put in an appearance on Facebook, and I track my ever-growing TRB list on Goodreads. You can find listings of all my stories here on the site, but they are also listed on my Amazon page.